The heightened war on corruption has rattled Ruto’s allies who claim it is targeting the DP and insists that the Building Bridges Initiative is being used by Raila to scuttle Ruto’s 2022 presidential bid. But Raila and his team, in turn have been accusing Ruto and allies of trying to scuttle Uhuru’s efforts to fight corruption. The recent threat by Siaya senator James Orengo to impeach Ruto for allegedly undermining Uhuru’s war on graft seems to have brought matters to head with the DP’s allies saying their apprehension of sinister political schemes had been vindicated. In pointed remarks yesterday, Ruto said the so called “Stop Ruto” movement will face a natural death since Kenyans will at the end of the day judge their leaders on development record and not propaganda. A tough-talking Ruto said: “Mradi wao ni wa kumharibia mtu mwingine kuomba kura.Mwenye kuamua si ni Mungu? Sasa hawa si wanafanya kazi bure. Wametuletea fitina, confusion na ukora. Ati hawataki tujenge barabara, tuunganishe stima na Big Four Agenda (Their main project has become stopping one individual from asking for votes from Kenyans. It is God who decides and they are therefore wasting their time. They have so far brought in Jubilee confusion, propaganda and deceit. They don’t want us to construct roads, connect power to people and the Big Four Agenda)”. Ruto said those trying to divide Jubilee will fail because the party has a strong foundation. “Let them come slow and wait for the right time to come because 2022 is still very far away,” he said. He, however, declared he has no time to engage his rivals, saying they are just playing petty politics.“They want us to start discussing who is doing what or who is doing better than the other, but I won’t engage in such useless debate,” he remarked. “If they are dreaming of dividing Jubilee, they should know they are building castles in the air, we know where we started, where we are and where we are heading to”. 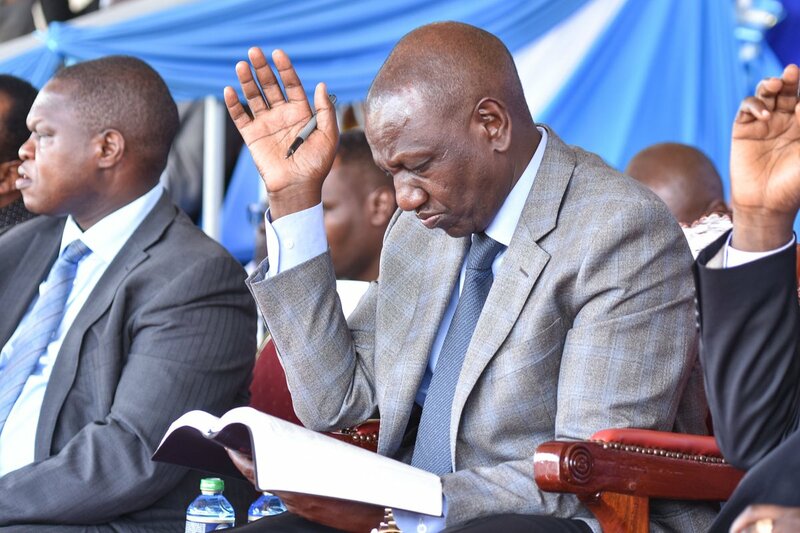 The post DP Ruto Prophesizes the end of “Stop Ruto Movement” appeared first on Kenya Today.